When Scandal first premiered in the spring of 2012, I was obsessed with the series. Its first season was perfect. I told anyone and everyone that they needed to watch the show. The drama about political fixer Olivia Pope (Kerry Washington), her affair with the president (Tony Goldwyn), and the not-so-merry band of Gladiators who wear the “white hats” and fix the world’s wrongs was compulsively watchable. Seriously, if you’ve never watched Scandal, take the time to watch the first season. It’s only seven episodes! Seven network episodes! That’s less than seven hours. I know you have the time. Don’t lie to me. Some of you have just finished re-watching the entire 15-season run of ER. The series, focused on a successful woman of color, was a juicy soap opera and intense mystery. Creator and executive producer Shonda Rhimes upended TV tropes. Olivia was unlike any of TV’s “other women.” She wasn’t vilified for sleeping with a married man. And as First Lady Mellie Grant, Bellamy Young) put a delicious new twist on the cliché, “Hell hath no fury like a woman scorned.” Mellie wasn’t standing by her man. He was a footstool on her own path to power, and Young brought simultaneous strength and vulnerability to Mellie. You feared her, but you also felt compassion for her. The chemistry between Washington and Goldwyn was crackling. One of the things Rhimes does best is create characters who are deeply flawed and yet, somehow, still convince us to root for them. Rhimes, in particular, understands that women are multilayered and not defined by their roles as mother, wife or daughter. Women can be make bad choices, but not be bad people. Rhimes refuses to engage in the Madonna/whore complex that permeates so many TV shows. So much from those early seasons of Scandal is iconic. The wardrobe—full of amazing coats, luxurious sweaters and killer power suits—should have an exhibit in the Smithsonian. For some reason, Olivia was always wearing gloves (no matter the weather), and the way Washington would take them off should be taught in an acting class. It was a simple, everyday act that was always laced with meaning. And who can forget Olivia’s favorite of dinner popcorn and wine, or her and Fitz’s dreams of living out their days in Vermont, or the way Washington delightfully enunciates every word? I wanted to be a client of Pope & Associates just so I could hear Olivia say my name. From the beginning, the stars of the series embraced social media and their fans. Even seven seasons later, they still live-tweet episodes and engage with their “Gladiators” in a way few other shows do. They understood that TV could be a conversation between viewers and creators. But by the third season, right around the time the series killed off James (Daniel Bucatinsky), I broke up with Scandal. My main complaint was that the series moved away from its mix of overarching plot and case of the week. 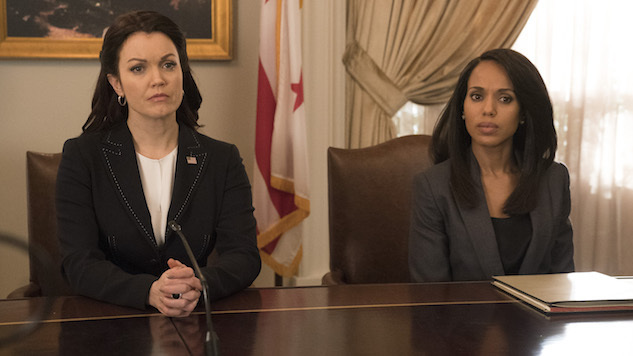 Once we found out Olivia and Mellie had conspired to get the president elected, the series became increasingly convoluted. It used to be that Pope & Associates would get a new client almost every week, someone seemingly unrelated to all their shenanigans who they had to help. But as the show got deeper and deeper into the ongoing conspiracy theory about a secret black-ops government agency, that faded away. It became all about B613 (or was it SD-6? Or the B-52s? ), all the time. Everyone was killing everyone. Everyone was prone to long, involved, sanctimonious speeches. All the characters started to sound alike. It’s easy to see why Netflix will be a perfect place for Rhimes: Scandal crumbled under the traditional TV model, which demanded 18 to 22 episodes per season. The series would have benefited from more succinct, seven-episode seasons. But to use the title of Scandal’s most recent episode, for a moment, the series stood in the sun and changed the proverbial game. A woman of color can carry a series. It seems silly that this is a point that had to be proven, but it did. In fact, Scandal kicked off a mini-wave of female-driven network dramas, including Shondaland’s own How to Get Away with Murder, Quantico, Shades of Blue, and the recent Station 19 and Good Girls. The series deepened how female characters could be portrayed. And most of all, it was a terrific soap opera, complete with outlandish plot twists, love triangles and characters who returned from the dead. I recently checked back in with Scandal and I found that even though I hadn’t watched it in years, I could pretty easily pick up on what had transpired since I last saw these folks. (It reminded me of how, no matter when I check back in on Days of Our Lives, it seems like I never left.) Mellie is now President and Noel from Felicity is a lot more evil than he used to be, but Olivia and Fitz are still doing their dance. The Gladiators, who’ve taken a back seat to the dramatic thrust of these final episodes, are still in the same offices hacking into computers and scheming. The clothes are still fabulous. There’s lots of red wine. I can’t say I’ll miss Scandal since I left it before it left me, but I’ll definitely tune into the finale “Over a Cliff,” which was written by Rhimes. At the very least, I need to find out if Olivia and Fitz get to grow old in Vermont. The series finale of Scandal airs tonight at 10 p.m. on ABC.